This autumn the Kremlin Museums present a show dedicated to a representative of one of the most refined epochs in arts and fashion: Paul Poiret, King of Fashion. This is a diverse exhibition encompassing dresses, accessories, designs and perfumes created by Poiret le Magnifique. Poiret with his exotic oriental tendencies, love and eye for colour, admiration for theatre and ability to express it all in a piece of clothing, was a pioneer in many spheres: he created designer’s perfumes, mixed fashion with interior design and was thus the first to promote the concept of a “total lifestyle” characteristic of the Art Nouveau epoch. Before the opening of the exhibition, PASSPORT Magazine’s Aline Kalinina speaks to the curator of the exhibition, Svetlana Amelekhina, keeper and curator of the fabrics department at the Kremlin Museums. Svetlana, how did the idea to make a Paul Poiret show in the Kremlin Museums emerge? Paul Poiret was originally a fashion designer, he made clothes, right? First of all, at the beginning of the 20th century, Paul Poiret was acclaimed not only as a successful fashion designer but equally as a talented artist. For the Russian audience he was a genuine star with Alexandre Benois naming him in one of his articles as a brilliant artist. Paul Poiret himself often said that he was a long way from being a tailor, and in the world of fashion and art he positioned himself as an artist and had an absolute right to do so. Secondly, in 2008, at the Moscow Kremlin Museums there was already an exhibition entitled: “Two Centuries of British Fashion” from the Victoria and Albert Museum’s collection. It was a huge success so we decided to make other exhibitions and tell our audience about more couturiers. This is how the idea of Poiret show appeared. Besides, Poiret first came to Russia exactly 100 years ago—in 1911. The exhibition comprises exhibits from four museums: the Musée Galliera (Paris Fashion Museum), which has supplied dresses, illustrations from Gazette du Bon Ton (a Paris-based magazine), accessories, shoes and hats; dresses from the Victoria and Albert Museum (London). Paul Poiret collaborated intensively with the Victoria & Albert museum when he studied the collection of Indian turbans for his own fashion collections. Poiret’s perfume line is generously contributed by the International Museum of Perfume in Grasse. And the State Hermitage Museum presents their collection of Paul Poiret’s evening gowns. 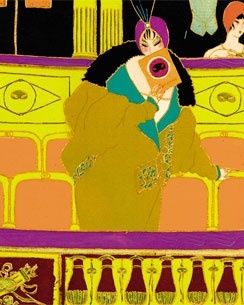 Poiret often mentioned that Sergei Diaghilev’s Ballets Russes influenced him a lot. What other sources of influence and inspiration can we find in his creations? Well, Léon Bakst had some influence on him, though in his memoirs Poiret usually dismisses this. 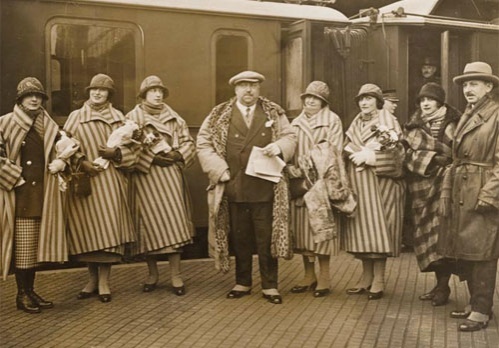 Paris, being the theatre capital of the world at that time could not but affect Paul Poiret. Poiret’s vision for fashion was expressed through his special silhouettes: “lampshade” tunic or his “harem trousers”, or pantaloons— his leanings towards the Orient. Also his high-waisted Directoire Revival silhouette was of the most avant-garde innovations in the fashion of his epoch. Those designs by the way appeared in two beautifully made and coloured pochoir editions—in Paul Iribe’s Les Robes de Paul Poiret (1908) and George Lepape’s Les Choses de Paul Poiret (1911). The same year—1911—Poiret made his first international tour when he visited Russia and other countries. He stayed in Moscow and Saint-Petersburg. His fashion shows were a huge success in both cities, attracting the local nobility and patrons of arts, and inspiring designers such as Erté (Romain de Tirtoff - a Russian born artist) for example who later followed Poiret to Paris. 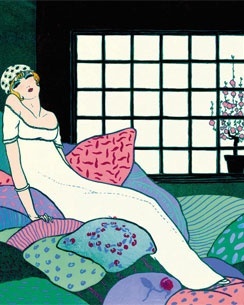 Erté spent one year there studying painting and fashion design and when he showed his sketches to Poiret, he was immediately invited to his Maison. Poiret made the young man acquainted with the publisher of Gazette du Bon Ton, and Erté’s later successful career is well-known in France and in Hollywood as the author of fine illustrations for the Vogue magazine and others. In his later memoirs Poiret remembered Moscow vividly, inspired by what he saw there, he created several collections named Samovar and Petrushka... In 1913, when he came to the US, his wife and muse Denise was wearing one of Poiret’s garments named Moscovite. Poiret named all of his creations. He created fashion for the leading actresses of his epoch such as Sarah Bernardt or Gabrielle Réjane. In our exhibition we make a special section for Poiret and Cinema presenting film images we found in the Cinématèque Française in Paris with actors wearing clothes in those films designed by Poiret. Please tell us some more about Poiret’s models and his principal Muse – his wife Denise. The principal muse and model for Poiret was his wife Denise. For Poiret this slender woman was the embodiment of the modern woman. He met her when she was about nineteen. To his friends he said that he saw a huge potential in this girl. He taught her fashion, but also taught her to pose for photographers and certainly wear his fashion. In our exhibition we present photographs taken during the couple’s visit to America in 1913. You can see what an icon of fashion Denise was then already, how simplistic and modern the Poiret creations look now. Vogue commented on every fancy accessory Madame Poiret wore. Her style was copied immediately. In the 1910s, Poiret started his own perfume line, can you tell us something about that? 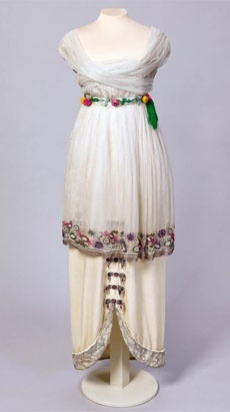 It was in 1911, when Poiret was almost at the peak of his career. He expanded his clothes business to include perfume, textile and interior design. The perfume company was named after his elder daughter, Rosine. And the interior Atelier was named after his second – Martine. 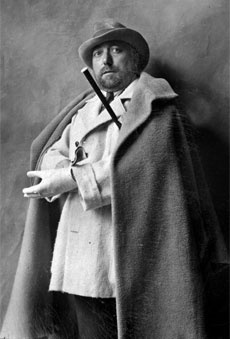 When Poiret was in Vienna, he had already become acquainted with the principle of “total work of art” by artists from the Wiener Werkstätte, but it is through his own approach which combined fashion, perfume and interior design that he elaborated this concept of “total lifestyle.” Directed by Poiret at the Martine Atelier theatre were created designs for book covers, delicate perfume flacons or wall papers, and he attracted well known though later artists and craftsmen such as Paul Iribe, Raoul Dufy, Georges Lepape. The exhibition is logically and spatially divided into two sections: in the One- Pillar Chamber we tell the Paul Poiret story before and during WWI. The second section presented in the Assumption Belfry illustrates Poiret’s phoenix revival.